We began by identifying the books in our book bags as fiction or nonfiction. The students justified how they knew if a book was fiction or nonfiction. 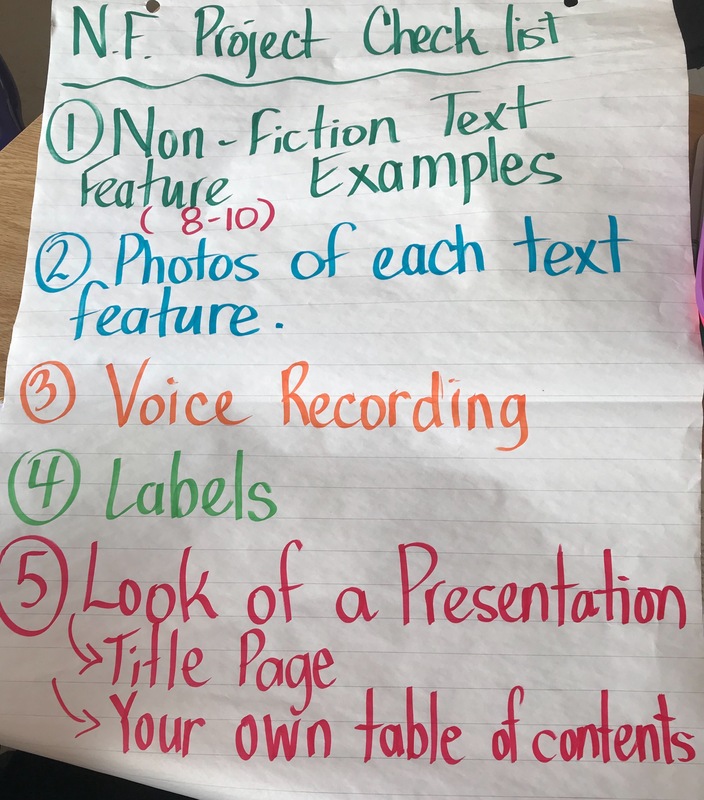 In small groups the students compiled lists of nonfiction text features that they noticed in their stack of chosen books. As a class we went through the Scholastic Book order and they decided which books were fiction or nonfiction and explained their choice. The students discussed whether there was a realistic photo, the title and if there was a synopsis about the book. We explored the “Explain Everything” app and played with it for a short period before getting into the project. I find that a “romance period” with a new tool helps to keep them on task when they begin their work. The app was fairly new to me but the students found it to be mostly intuitive. They were really stoked to use the feature that points to the words using a “light sabre”. There were a few glitches with accessing text edits but eventually they got the hang of it. We have the free trial version. The actual app is quite expensive. 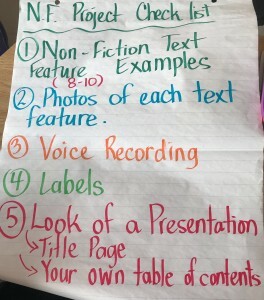 I explained to the students that our younger “buddies” were going to be learning about nonfiction and their teacher was looking for an engaging presentation about nonfiction text features for her students. By setting up an authentic purpose and audience for writing, the students were engaged immediately. 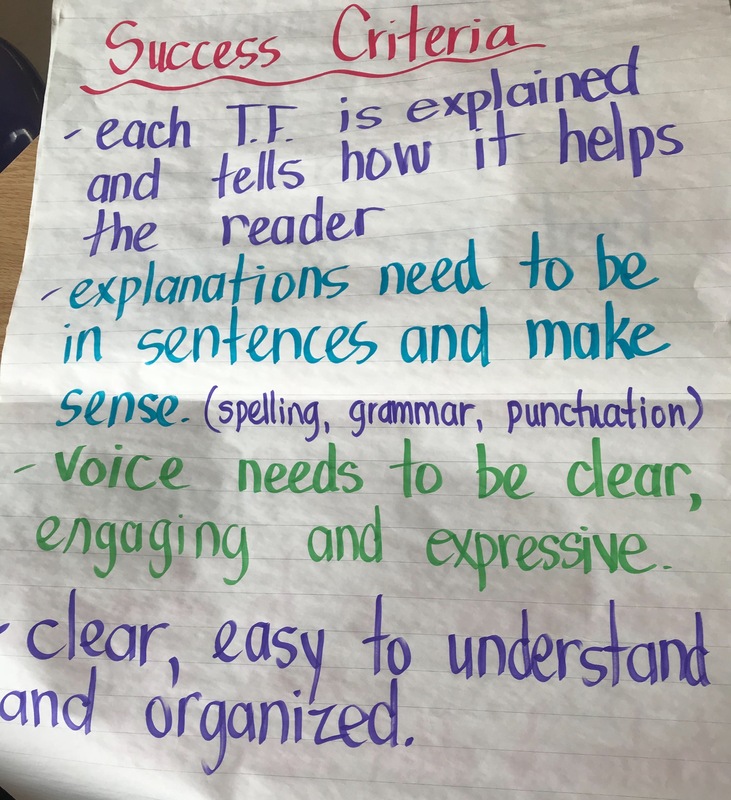 These are the learning goals, success criteria, project checklist and anchor charts that we developed over a period or two. We added and changed some things as time went on as well. The students really had to think about the information that a nonfiction text feature gave them as a reader. The learning was much deeper by creating a teaching video than if they had just identified the features in texts. 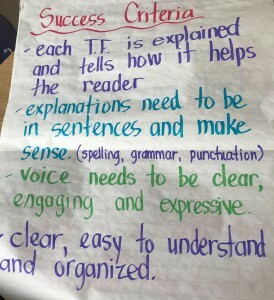 Students referred to the success criteria and checklists throughout the project. Before they came to me they had to have some peer feedback. They put their first draft on Seesaw and I provided some feedback online. The students edited and adjusted from peer and teacher feedback and then posted for parents to see on Seesaw. Below the blog, I have included three different examples of projects from both grade four and five.